Sorry about the bad pun for those of you familiar with the music of Boy George. And thanks to whoever created this meme. 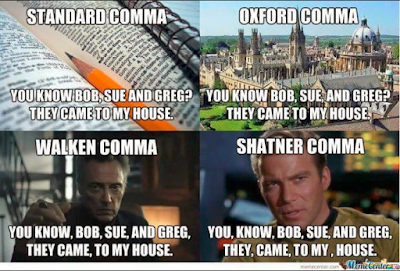 Do you prefer the Oxford or standard comma? This is funny! I prefer standard, but I'm used to juggling them all the time in my day job. It can get tricky. Oh, interesting! Thank you for that information and the kind comment, Nick. Now I have that song going through my head. I'm actually in the middle of pondering over my comma usage while editing. Hope I didn't distract you! That is pretty funny. 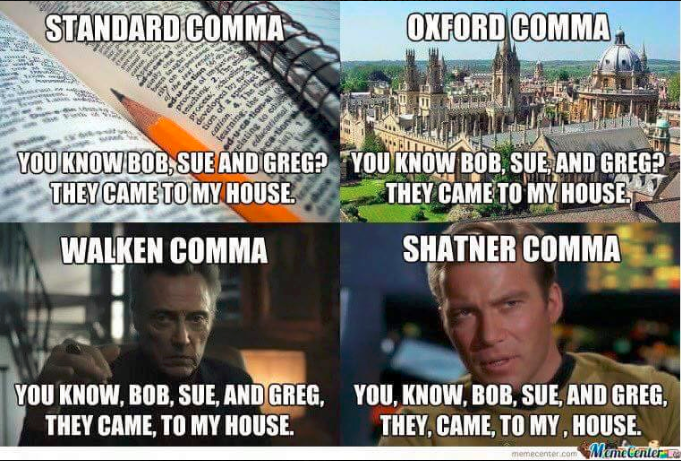 I'm an Oxford comma girl, myself. My logical brain needs the consistency. How cool that we agree on that! The Shatner :) My hubby and I are trekkies . I can sound picture the Walken Comma, thanks for that. And also notice the poor comma usage in above sentence. That was lazy. Hahahahaha... Thanks for your online presence. I always appreciate your great comments. I am fine with the use of the Oxford comma, if semicolons are used, where applicable, in conjunction, throughout.